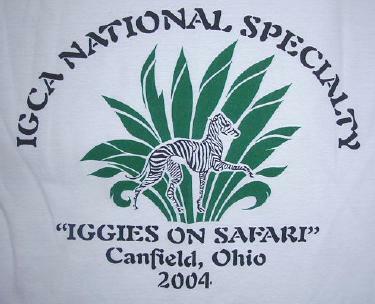 There are a limited number of 2004 National Specialty tee shirts left. In time they will become collector's items. They are also comfortable and well-made. Here's your last chance to order one. These tees are made of a heavyweight ultra blend of cotton and polyester. They are QUALITY tees!!!!! Sizes are available in Medium, Large and XL. Price $14 per tee shirt or 2 for $25 INCLUDING SHIPPING! Sale of these tees benefits the IGCA Health Fund. Please email LonghouseJ@aol.com to order .